ELANZA Simulated Diamond (Rnd) Ring in Rhodium Overlay Sterling Silver, Silver wt 3.08 Gms. Designer Inspired - Diamond (Bgt and Rnd) Ring in Platinum Overlay Sterling Silver 0.750 Ct.
Blue Diamond (Rnd), White Diamond Ring in Platinum Overlay Sterling Silver 0.500 Ct.
Eternity is a beautiful word signifying timeless existence. Affix it to love, affix it to jewellery and you are in for a delight. Rings have been used as an expression of love and commitment since the beginning of time and the confluence of both created a traditional symbol of undying and eternal love, an Eternity Ring. Crafted as either full or half with a series of diamonds and other precious gemstones going all the way round the band or sitting on the top half of the band, these eternity rings are usually gifted at a momentous occasion in the relationship after marriage. There is beauty in how a single file of stones is capable of producing a brilliant band of light and we at TJC excel in creating exclusive and majestic rings for you. Designed to stand apart, our in-house brand Iliana features high-end eternity rings that will hold your interest until you choose one. Every woman wants an eternity ring, not just ladies in the UK and we have created some exquisite pieces with a series of round, square, baguette and oval stones set carefully in precious metals for everyone. A diamond is widely associated with love, bonding, commitment and loyalty, a circle on the other hand is known to be a symbol of perfection, representing holiness and peace. A diamond eternity ring ring has been the most popular style with diamond after diamond running in a circle and representing perfect and eternal love. These rings are timeless pieces and have been accentuating the beauty of slender fingers for decades and in ancient times, the wife was gifted this style of ring by the husband after the birth of their first child. TJC brings to you a vast variety of styles like a combination of square and baguette cut diamonds, coloured stone and diamonds, marquise cut diamonds in bezel setting, etc. Despite being worn as a symbol of love like wedding and engagement rings, Eternity rings have evolved to be worn on any finger. Either pair it with your wedding band or engagement ring or let it sit on the third finger of your right hand, wear it however, it will only add more glamour to your persona. Crafted in gold and silver or complemented with platinum overlay for an opulent look, these sturdy rings will be practically glued to the finger before you decide to pass them down as an heirloom; yes, they last for that long. Set elegantly in a bar, channel, grain or claw setting, an eternity ring featuring an array of coloured gemstones is another style that is increasingly gaining popularity among the women in UK. To be able to cater to diverse needs and resources of our valuable customers, we feature all kind of gems in these rings right from Swarovski to Topaz, to rare Monte Belo Indicolite and Kanchanaburi Blue Sapphire. 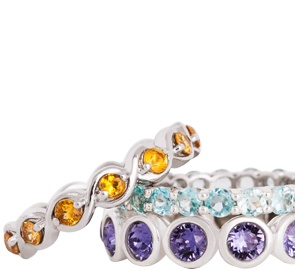 Wear a full ring or a stack of multi-coloured half rings to accessorize your everyday look. TJC specializes in making rare gemstones available to you from within the comfort of your home and has the largest collection of Ruby, Emerald and Sapphire silver rings with white gold, rose gold and platinum overlay to make sure you are spoilt for choice. Treat yourself with never ending affair of diamonds and precious gems from TJC’s exclusive collection today.